August has been a very busy month. 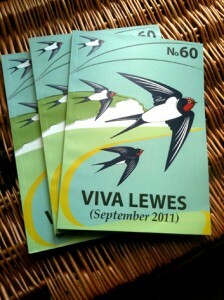 Aside from curating ‘Art at The Hive’ in Lewes, The Hives‘ first show for the Artwave Festival, I was fortunate enough to have the opportunity to work with Viva Lewes to design the cover for their 60th issue. Being their September edition I was interested in doing something around bird migration and swallows seemed to be the ideal bird to concentrate on. Many people consider the arrival of swallows as being a real indicator of the onset of Spring but maybe don’t necessarily notice their departure come the end of Summer. By depicting them flying from the shores of the British Isles (namely Seaford Head in Sussex) I wanted to evoke some of the poignancy of the changing of the season. The cover is now being produced in two sizes of limited edition giclée prints and I will soon be making a screenprinted edition within the month so watch this space! If you would like more details about prices, dimensions and edition sizes please contact me directly.